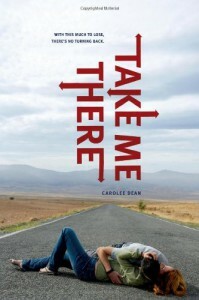 Take Me There is brilliant! I love the way the book is set up and that the book is narrated from a boy’s point of view. There are poems at the beginning of most chapters. I don’t want to give away the reason for the poems, but it’s a good one. I can tell you that thes poems are written by Dylan and it shows he has a sensitive side that’s really sweet, but he doesn’t even know it. Even though his mom is depressed, he is still that good son who doesn’t want to disappoint her. Dylan tries so hard to stay out of trouble, but it keeps finding him everywhere that he is. Some of this is his best friend Wade’s fault and at other times it’s his family’s fault. I love Dylan’s ambition and how he can be really deep. There are so many twists and turns in this book, that I couldn’t stop reading and couldn’t wait to find out answers. The author, Carolee Dean really keeps you on your toes guessing throughout the entire book. She does a great job at showing Jess and Dylan’s blossoming relationship, but I wish I could have known more about them. They seem like they really love each other. The ending was great, but I wish there was a sequel. Of course, all books have to end somewhere, but this one is just so good I really want to know more! The Cover: The cover is great! It really works because of the road and the couple. During the book, I actually looked at the cover a couple times because it was so cute.